This is a work in progress. We already know it's buggy. 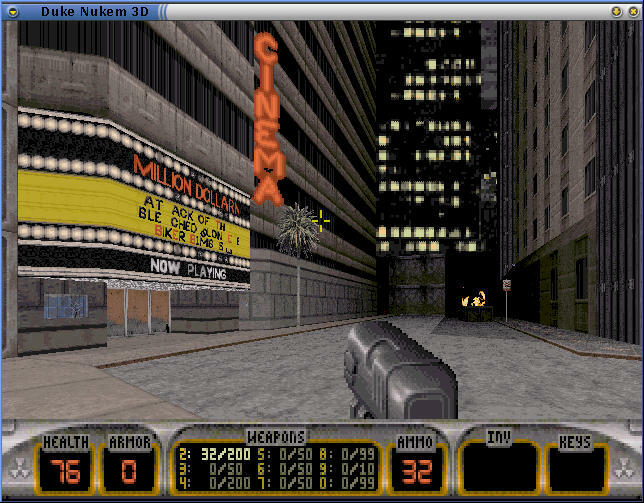 Duke3D runs natively on Linux now, thanks to 3DRealms releasing the game source. Hi-res (what would be "VESA modes" in DOS). Record and playback demos compatible with the Atomic Edition (1.5). Shareware and retail versions should all work. BUILD editor works to a large degree. In-game UI for keyboard configuration (original used external program). Assembly code all has portable C fallbacks, now. Probably works elsewhere without much effort. Joystick input isn't working yet. MacOS X: netcode has byteswap issues when playing with x86 players. savegames aren't compatible between big/littleendian systems. File cases need to be exact in some places, not others. Netcode handles packet loss _VERY_ poorly...it's fine for stable connections and LANs, though. Configuring a multiplayer game involves editing text files and filling in IP addresses. Not very user-friendly. Some text prompts try to read the SDL input queue instead of stdin like they should. Probably other stuff. Do NOT consider this stable and complete yet! Make sure SDL and SDL_mixer are installed on your system. MacOS X users should build/install these in "the unix way"...i.e., configure scripts, not Project Builder. Make sure you've got a Duke3D ATOMIC EDITION cd-rom. You might be able to get away with the shareware version or one of the other retail versions, but I haven't tried. Once you have the game installed, and run setup.exe under DOS to generate a duke3d.cfg file. Select any sound card for music and FX playback (we use this as a on/off switch for audio). Copy the installed game dir to your Linux system. You should have a "duke3d" binary now. Copy it to the game dir. There are some .con files in the "testdata" dir you get from the duke3d Subversion. Copy them to the game dir, CAPITALIZED, so they overwrite the ones that came with the original game. If you get really bad audio output under win32, edit your Duke3d.cfg file so "MixRate" is "8000" and not "44000". YMMV. On BeOS, the "make" lines above should be "make beos=true". On MacOS X, the "make" lines above should be "make macosx=true". On Solaris, the "make" lines above should be "make solaris=true". On Linux/ppc, the "make" lines above should be "make linux_ppc=true". On FreeBSD, the "make" lines above should be "gmake freebsd=true". On Windows, there are Visual C++ 6.0 and Visual Studio.NET project files in the "duke3d" directory. Tough luck. Do NOT contact us with bug reports at this time. Do NOT contact us if you can't get it to build. Do NOT contact us for copies of the game. In fact, if you aren't sending us code, don't contact us at all. The 3DRealms Forums might help you, however. This port was done by Dan Olson, Steven Fuller, and Ryan C. Gordon, with contributions from David Koenig, Dave Watson, among others.